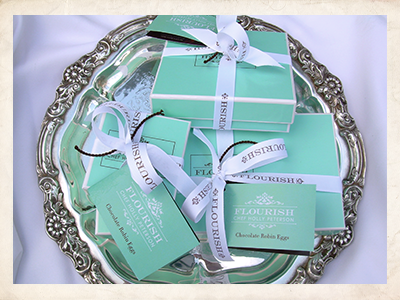 Flourish Chocolate offers its exquisite iridescent chocolate Robin’s Eggs as corporate gifts, hotel amenities, and custom orders. Delight and impress your valued clients. Our unique chocolate makes an unforgettable artisan gift. Assortments available in 6-piece, 18-piece, and 30-piece boxes, and nine delicious flavors. We'd be delighted to hear from you. Please email us at Chef@FlourishChocolate.com or call 707-942-9494.